You have to build the factory before you can make the product, and that includes when you work sitting on the floor of a hotel room while on business travel like I did for years. Your factory can be as simple as a small plastic tote or gym bag with all your materials and tools packed inside. However, the key to maximizing the amount of time you spend working on art is minimizing how much time you waste laying out and putting away materials when you are done. A designated desk or worktable can make all the difference in the world as far as productivity, especially if you lay out your tools and materials in an efficient way and keep things organized so you aren’t constantly cleaning up messes or clutter. I wanted to talk about art studios in general first before how to configure a studio for mosaic work. My acrylic painting studio is a better example of basic principles for organizing the home art studio because my mosaic studio is at the warehouse and the tables and racks are larger and on wheels and are made for working on larger sculptural mosaic. However, I do have some mosaic-specific points at the bottom of this article. 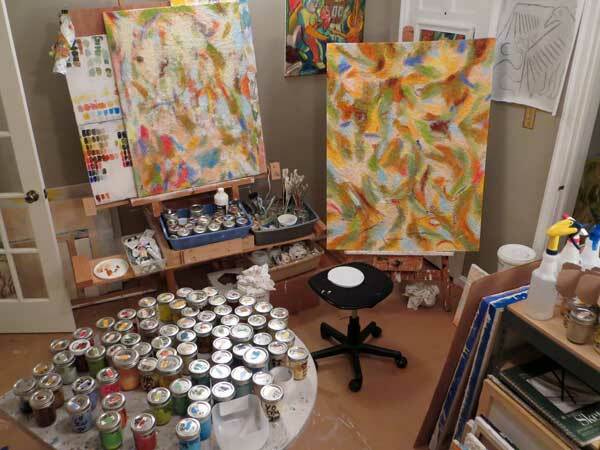 In my painting studio, I have things where I am surrounded on three sides by brushes and palette tools and paints and rags all arranged in the order I reach for them with minimal travel distance to the canvas at the right. Note that the totes of brushes and tools and rags and paints are all positioned about knee high so that I can reach them easily while seated. Note that there are other easels and nails on walls for displaying works in progress and color studies. Note there are open shelves just out of camera view to the left and right. Factories that have workers doing complicated assembly tasks by hand usually have them doing this work at stationary tables called workstations and not on moving assembly lines or conveyors. The layout of these workstations have been optimized to shave seconds off of each step in the process and minimize the total floorspace used. Bins of parts and tools are arranged in order at just the right height so that the worker has to reach a minimal distance. Often the workstation is C-shaped with the worker in the middle. There is adequate lighting and a plan for how parts flow into the workstation and finished products out without the operator having to take a step. Few professional artists have had the first course in Industrial Engineering, but their studios often look like workstations professionally designed for a factory. Maybe that shouldn’t be surprising. If you work in a place day in and day out, and you are clever enough to create art, your tools and materials tend to get arranged in an efficient layout over the years merely by trial and error. But as a trained engineer, I can see at a glance the extent to which these studios are ergonomically efficient, and it is remarkable just how honed some artist’s work spaces are, especially when laid out for one specific activity like sewing or painting or assembling small sculptures. The more difficult question is how do you lay out your limited space at home when you use it for incompatible processes like sewing and mosaic making, which requires mixing up grout and cutting and gluing tile, all processes that are inherently messy and could easily contaminate fabrics. Make a basic layout that maximizes work surfaces and open shelves where you can see and reach different materials. Keep tools and materials for a specific media or process in plastic totes or open-top boxes. Move the totes in and out of the workstation based on which process you are using. Have a separate shelf where totes of specific materials stay when not in use. Subdivide each tote with smaller containers that organize tools and materials as needed. When possible, do you work on trays or boards or shallow totes that can be moved with everything on it as a work in progress. You must also divide processes into clean processes versus messy processes, and this is sometimes relative. For example, attaching tiles by thinset mortar involves handling a sticky variety of concrete and using a bucket of water to rinse you hands and loose concrete and grit will contaminate the work surface around you mosaic. However, an artist with a little bit of experience can easily contain the mess by using a plastic drop cloth on the table and being neat with rags and a vacuum. This is a relatively clean process that could be done inside in your studio. On the other hand, mixing up grout or thinset can create dust, and washing up the buckets and tools are best done using a water hose. Note that these tasks are usually shorter in duration and are not the actual implementation of the design, so they are best done outside of the workstation you are using for your clean processes. Locations like driveways, patios, back porches and garages are more appropriate for these dirtier processes. This exterior space or space(s) should also be used for any sawing, sanding or drilling, although avoid using power tools and hoses at the same time or using power tools on damp surfaces. A folding plastic table with locking legs is a great thing that can save a lot of strain on your knees and back. Don’t bend over or squat to mix up grout or wash out buckets like most people are tempted to do whenever they work with a garden hose. Suddenly they are 8 years old again even though their lower back isn’t. What happens is you get into what you are doing and don’t realize you are getting stiff and need to change positions. Something as simple as an overturned plastic milk crate can be used as a seat for working close to the ground with a hose, but you are better off with a seat with lumbar support or standing at a table. You always end up bent over longer than you had planned to be. shelves and open storage areas that display materials in a visible and accessible way. an arrangement that puts the artist at the center of work surfaces and shelves. an arrangement that doesn’t require to bend over or hold awkward poses. a seat, preferably with lumbar support, that can be quickly rolled out of the way. an easy way to move materials in and out of the workstation. use plastic storage totes to store everything for a particular process. move these totes in and out of the workstation when changing processes. don’t use your workstation to store totes for processes not in use. Mosaic work that is simply attaching sheets of mesh-mounted tile to a surface can be done in an area for messy processes or on site. The workstation used to create the sheets of mesh-mounted tile could also be used to create small and medium-sized mosaic plaques and sculptures, no matter if Weldbond adhesive or thinset mortar is used. The only difference being is that you have to go to you “messy process” area to mix up your thinset and wash out the buckets and tools at the end of the session. a comfortable seat with lumber support. plastic containers such as yogurt and butter tubs for holding tile pieces. shallow trays for catching and holding pieces of tile while being cut. I also wrote a page for specifically setting up a workstation for using thinset mortar. For most processes, especially mosaic, it helps to have a vacuum handy within reach. This entry was posted in Inspiration, Joe's Rantings and tagged studio space on October 16, 2013 by Joe Moorman. Thank you for this information. It is exactly what I needed and the information covered more than what I had in mind for setting up shop.